Wellington, Fla. – Feb. 17, 2017 – Mark Bellissimo and the International Polo Club Palm Beach (IPC) in Wellington, Florida, hosted the USPA-sanctioned and highly-innovative Gladiator Polo™ arena event, presented by U.S. Polo Assn. on Thursday, February 16. Spectators and polo fans assembled at the Equestrian Village of Palm Beach International Equestrian Center (PBIEC), also known as “The Coliseum,” to witness some of the highest-ranked arena polo with an unprecedented $250,000 prize purse over four months. Winning team Spiculus: Juan Martin Zubia, Pelon Escapite and Sebastian Merlos with Mark and Katherine Bellisimo. Priscus’ Jeff Blake reaches for the ball with Spiculus’ Juan Martin Zubia on his hip. (c) David Lominska/International Polo Club. Teams competed for the initial $24,000 for the winning team and $6,000 for the losing team in the preliminary round match. Sporting a new look, both ponies and players donned new team uniforms. Matching wraps, saddle pads, equine head sleazys and helmet covers created a cohesive look for each Gladiator team. Spiculus in purple consisted of 9-goaler Sebastian Merlos and 7-goalers Pelon Escapite and Juan Martin Zubia. 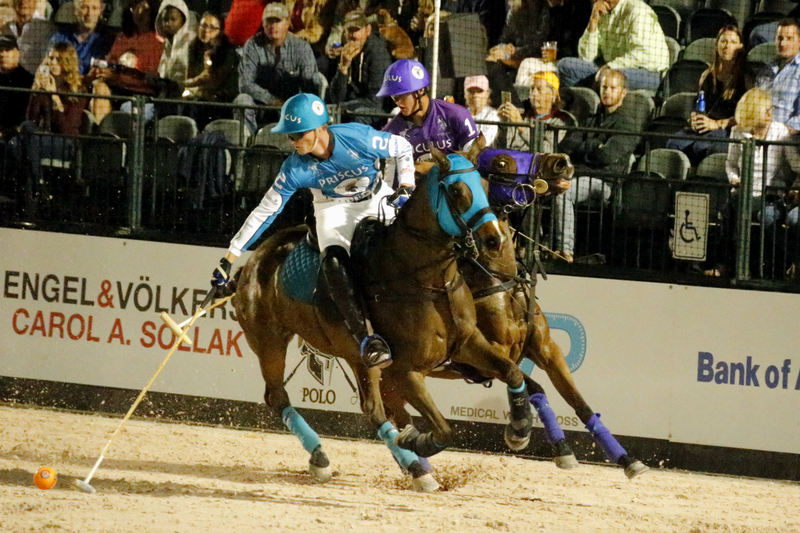 Pitted against Spiculus was Priscus in teal led by 8-goaler Jeff Hall along with 7-goaler Jeff Blake and Tommy Collingwood (substitute for 8-goaler Julio Arellano). The two all-star teams, named after Roman Gladiators, played on the flat over six five-minute chukkers of continuous play. Sebastian Merlos of Spiculus takes a neckshot to goal. Photo by David Lominska/International Polo Club. It was obvious from the get-go that Spiculus had the edge with 17-year-old phenom Zubia controlling the field. After the first chukker, five combined goals from Escapite and Zubia answered by a lone goal from Blake left Priscus trailing by four. 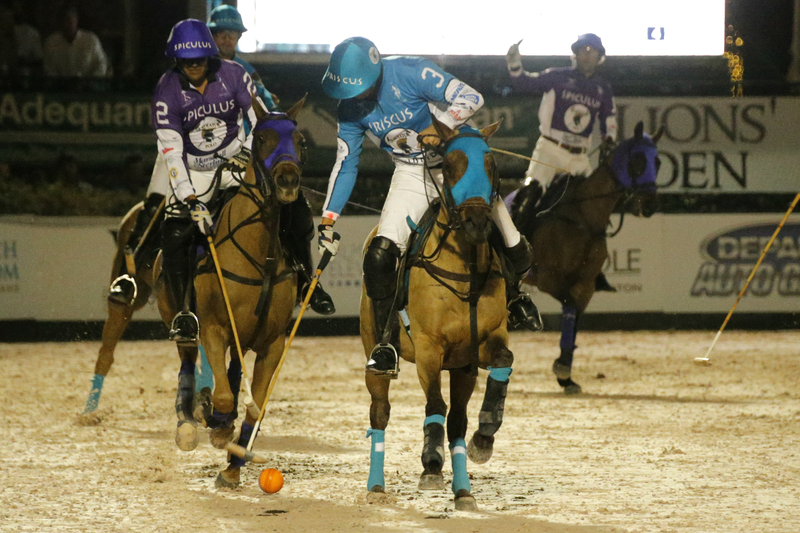 Spiculus continued their onslaught of goals throughout the second and third chukkers until another goal from Blake, the first two-pointer of the game, ended the first half 12-3. Priscus’ Jeff Hall and Tommy Collingwood talk strategy. A two-point goal from Collingwood in the fourth allowed Priscus to gain momentum as they matched Spiculus’ three goals for a score of 15-6. The comeback was short-lived and Spiculus widened their lead in the fifth with four more goals to Priscus’ two. Entering the final chukker 19-8, each team was able to put one more goal on the board. Spiculus came out on top with a decisive final score of 20-9. 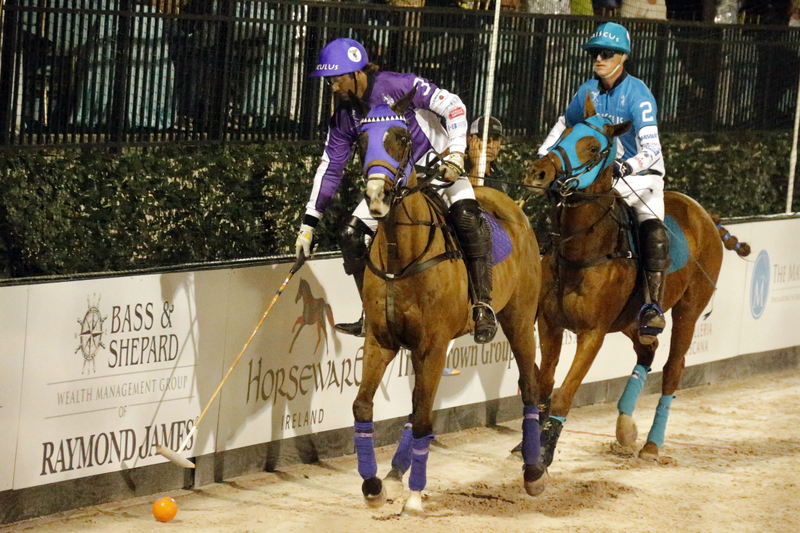 Spiculus’ Sebastian Merlos on the ball with Priscus’ Jeff Blake close behind. Priscus’ Tommy Collingwood carries the ball down field with Spiculus’ Pelon Escapite coming in for the hook. Photo by David Lominska/International Polo Club. 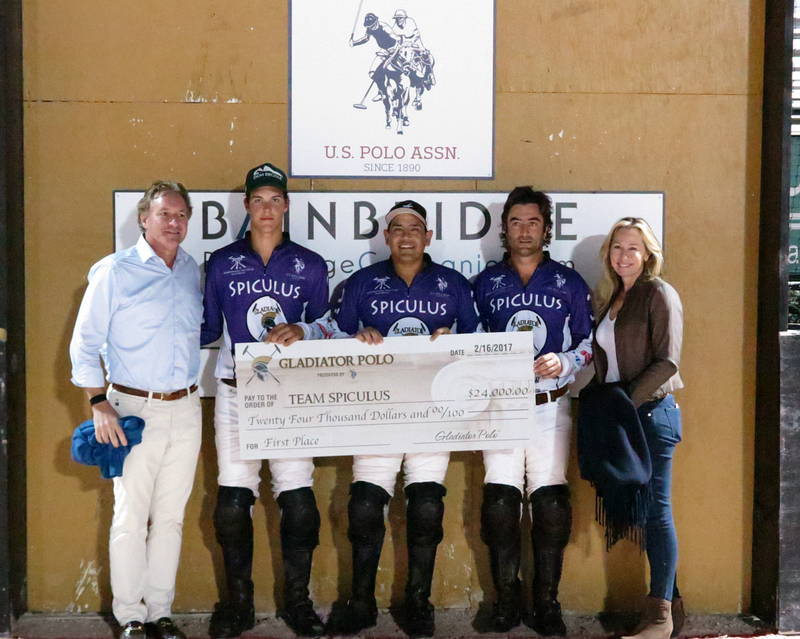 Gladiator Polo will continue on February 23, Spiculus will face Spartacus winners of the inaugural match. 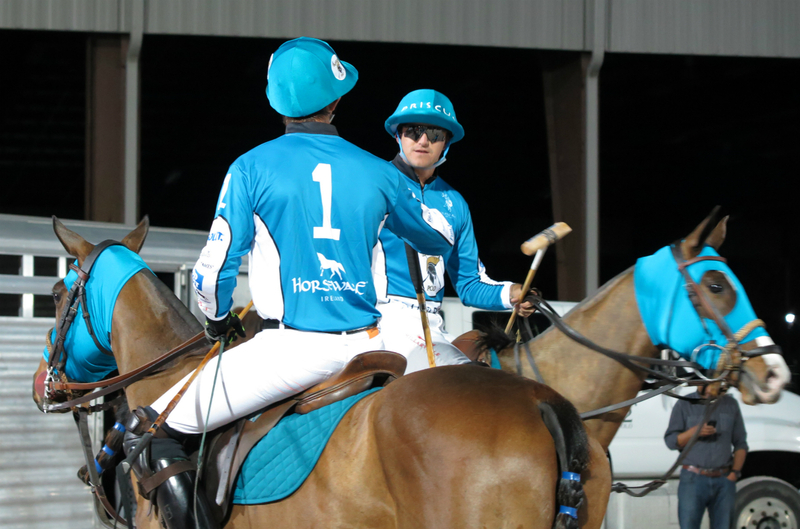 The next four games of the Gladiator Polo™ League will be March 9, March 16, March 30 and the $50,000 Gladiator Polo™ Final on Saturday, April 8. 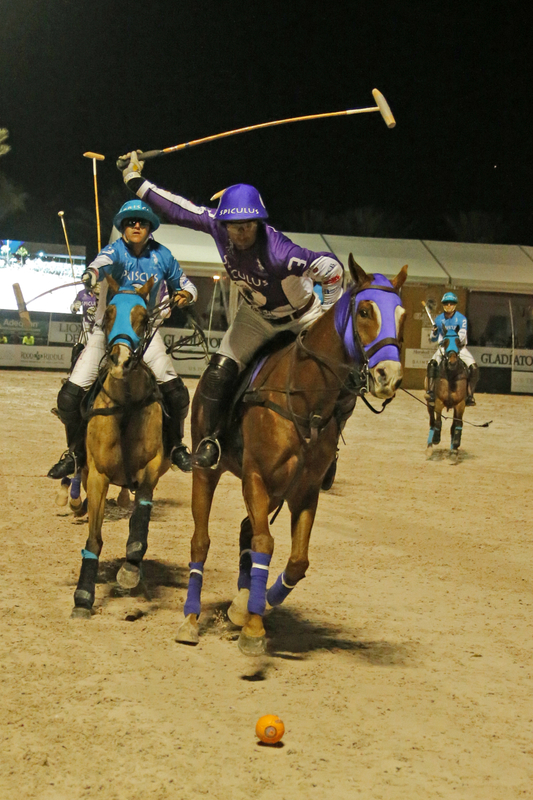 All Gladiator Polo ™ games will be livestreamed on the USPA Polo Network. Mark Bellissimo Announces Expansion of 2017 Gladiator Polo™ League Presented by U.S. Polo Assn.